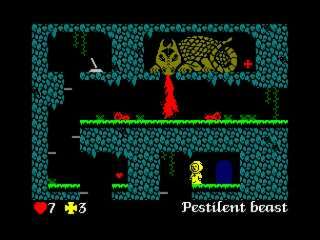 Abbaye des Morts is a freeware game made by LocoMalito (with the help of Gryzor87 in music side) in 2010. This game is, like other Locomalito's game, developed with Gamemaker and only runs natively in Microsoft Windows systems. This is a port of this game to GNU/Linux systems. Is written in C code with the help of SDL libraries. The code is licensed under GNU GPL version 3, so anyone can download, see, change and redistributed the code. Here is a Caanoo recompiled version by me (farox). I have added button control and created a package for caanoo. Y = in the main menu show info of the game. With the latest change from the author now the game is fullspeed. Congratulations, the CAANOO is officially dead. @toepoolest Not for me!! Mine is working good.